I joined a local club, Dumfries Saints, when I was at primary school and stayed there until U17s. How did the move to Leicester come about? I played for Scotland U18 with Corey Venus from Leicester and he said they needed a scrum-half, so I wrote to them and got a week’s trial in the summer of 2011. I got invited back for the JP Morgan Sevens and was given an academy contract, then a two-year full-time contract in 2012. I was a wing, then a full-back. I moved to scrum-half at about 15. My dad John suggested it because I wasn’t that big. Scotland U17, U18 and U20. I really enjoyed the World Championship. My highlight was scoring a try against the USA. What are your hopes for this season? To get more opportunities to play at Leicester so I can show what I can do. RW verdict: Having turned 20 in July, it’s time for Steele to step up from age-group rugby and fulfil his potential. Want to see who’s turning the heads of international rugby coaches every month? Then subscribe to Rugby World! 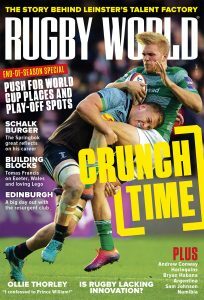 Click here to get the latest subscription deal, or find out how to read RW on your iPad or android tablet here.